Management tasks that relate to the need for viewing information about Distribution Group settings, Distribution Group members and so on. Management tasks that relate to the need of exporting information about Distribution Group. 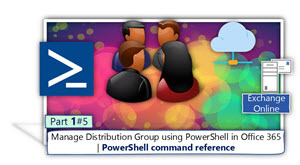 In the following example, we “extend” the information that we get from the basic PowerShell command- Get-DistributionGroupMember. 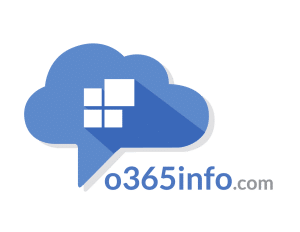 In the following example, we want to get information about Distribution Group that their E-mail address includes a specific domain name suffix. Display information about Distribution Group that was updated before or after specific date range. In some scenario, we need to get a list of Distribution Groups that was created in specific date \Time or Distribution Group that was created in a specific time range. Scenario 1 – We want to add a user to all NEW Distribution Groups, that was created in a specific time range – last two weeks. Scenario 2 – We want to add a user to all Distribution Groups, that was created in a specific time range – all the Distribution Group that was created before the last two weeks. To be able to “know” when a specific Distribution Group was created, we can query the Distribution Group property – “WhenCreated”. 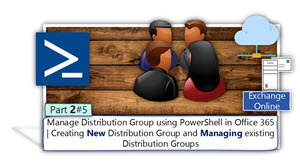 To be able to find the Distribution Group that “belong” to the specific time range such as the last two weeks or the time before the current two weeks, we need to use the PowerShell logical operators. Get a list of Distribution Groups, that was created in the last 2 weeks (during the last two weeks). For this purpose, we use the PowerShell operator – ge (Greater than or equal to). Get a list of Distribution Groups, that was created before the last 2 weeks. For this purpose, we use the PowerShell operator – Le (Less than or equal to). cmdlets Get-Date, in the following way: (Get-Date).Adddays(-14). Get a list of Distribution Groups, that was created before the last 2 weeks. In this example, we want to get a list of all Distribution Groups that are managed by Specific user. In this case, we want to get information about Distribution Groups which have a moderator. For this purpose, we can use a “simple PowerShell command” or a more sophisticated PowerShell command. 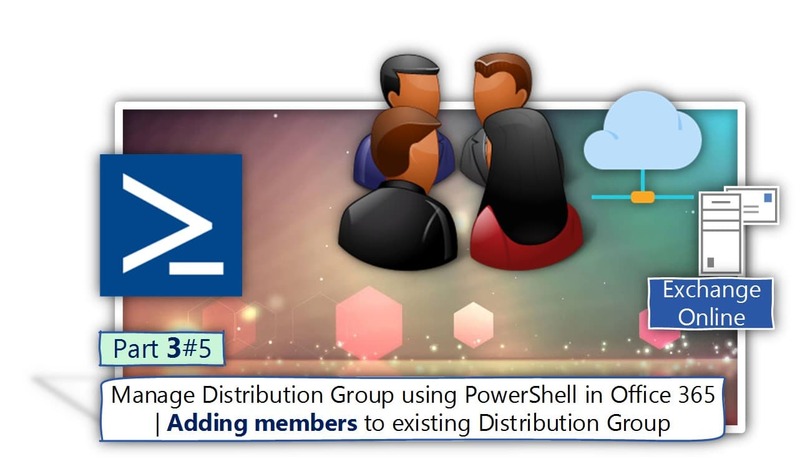 In the following example, we ask from PowerShell to get a list of all existing Distribution Groups and present the following properties – display name + the property ModeratedBy. The information that will be presented will include Distribution Group with a moderator and also without a moderator. In this example, we want to get a list of all Distribution Groups that are considered as synchronized Distribution Group. The term synchronized Distribution Group relates to Distribution Groups that was created in On-Premise Active Directory and synchronized with Exchange Online by using Directory synchronization server. The term “delivery management” describes the setting that relates to “allowed” senders. Internal senders (organization recipients) which describe as authenticated recipients. External senders (non-organization recipients) which describe as unauthenticated recipients. In other words, by default, external recipients are not allowed to send an E-mail message to the Exchange Online Distribution Group. In this example, we want to get a list of all Distribution Groups that can accept E-mail from external recipients. In case that the value of the parameter – RequireSenderAuthenticationEnabled is – $True, the meaning is that the Distribution Group will accept E-mail from external (non-organization) recipients. In this example, we want to get a list of all Distribution Groups that cannot accept E-mail from external recipients. 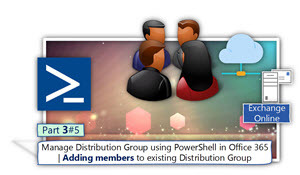 Get information about Distribution Group membership of a specific user. which a specific user is a member of. $User = read-host “User Name"
"The User " + $User + " is a member of the following Distribution Groups:"
or “Get-DistributionGroupMember” for fetching information about the Distribution Group infrastructure (get a list of existing Distribution Group, get information about group membership and so on). Every information that we can display on the PowerShell console, can also be “exported” to various types of file formats. PowerShell supports the option of exporting PowerShell command output to the following file formats: Text, CSV, HTML, and XML. To be able to export the required information we need to tell PowerShell what is the “file format” that we want to use. In addition to the PowerShell cmdlet’s that define the specific file format, PowerShell provides a dedicated “export command” for each of the file types and a unique parameter for a specific file type. When we want to export information from a PowerShell command output to a file, we will need to provide PowerShell the exact path and the file name. The PowerShell command that exports the data will use the “path information,” in creating a new file in the specified path. It’s important to mention that when we provide a path, such as C:\Temp, the PowerShell command “except” that this path is already created. In other words, by default, the PowerShell command will not “create for us” a specific folder that was specified in the path. The following section, include a demonstration of exporting PowerShell command output to three types file formats. 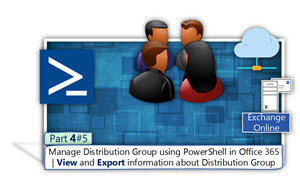 Get-DistributionGroup that as the name implies, get information about existing Distribution Group and by default display the information on the PowerShell console. 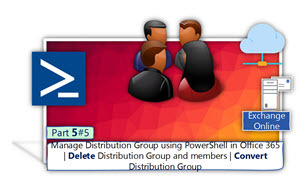 The task of exporting information about Distribution Group members to a file could look like a simple task, but this task required some “manipulation” of the PowerShell syntax that we use.